Cutting a bagel for breakfast or lunch should be a simple and straightforward task. After all, how hard is it to slice a bagel into even halves? Yet most of us have experienced the struggle of getting a symmetrical cut. Often we end up with one piece significantly bigger than the other. They will toast at different speeds, and one side will be burnt to a crisp while the other will still be soft and undercooked. Some people don’t even manage to cut the bagel into two pieces before something goes wrong. Did you know that improper bagel cutting is the fifth most common knife injury suffered in the United States? Looking at it from that perspective, it actually makes a lot of sense. Bagels have an unusual ring shape, with a dense but chewy interior. They can be both slippery and tough; a circular hazard that is a slice away from happening. This is why it’s important to have the proper tools to make the bagel cutting process easier. Why worry about proper technique – as if there is such a thing for bagels – when you can cut it cleanly in half every time with no risk of injury? You owe it to your hands and fingers to have safely and evenly cut bagels with the help of the best bagel slicers on the market today. Below are brief reviews of the best bagel slicers that are on the market today. There are various types of bagel slicers which we talk about in-depth at the bottom of this review. Each type has their own strengths and weaknesses as well as cost, and which one you pick is based on your preferences. Without further ado, let’s get into the review. 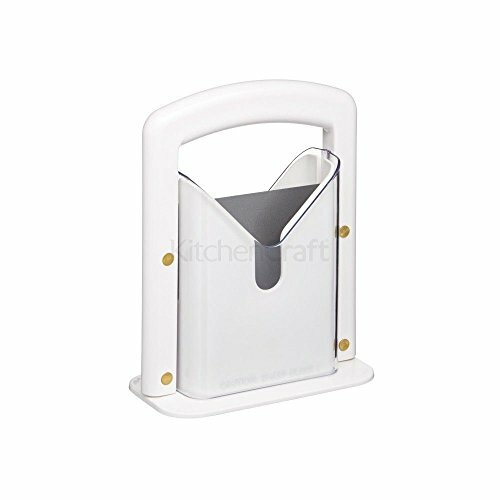 The Kitchen Craft Bagel Guillotine provides a quick and easy way to cut bagels. It has a non-slip base, and uses a guillotine style cutting method to slice the bagel cleanly in half. Simply load the bagel into the holding tray and move the guillotine down with the handle. You don’t need to apply much pressure at all, just let the blade do all the hard work. Cleaning is extremely easy as well. The Kitchen Craft Bagel Guillotine is dishwasher safe, so just throw it in there and forget about it. Don’t worry, the blade is made from stainless steel and will be completely fine during repeated washing. The acrylic finger guides ensure that your fingers are never in harm’s way when slicing the bagel. This is a great entry product for those who are looking to get their first bagel slicer. For those who want the simplest solution to their bagel slicing problem, you can rely on the Lifetime Brands Hoan Bagel Guillotine Slicer to help you out. 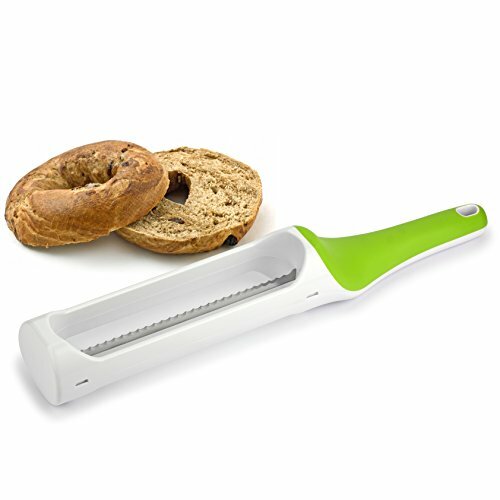 Its design makes slicing bagels an effortless task. First, the cradle holds the bagel in place. Next, the XYLAN coated blade will bisect the bagel. The acrylic safety covers will keep fingers far away from the path of the blade. You don’t have to only cut bagels with this model. Muffins, buns, bread rolls, basically anything that can fit into the cradle can be cut cleanly in half. Keep in mind that depending on the size of the roll, some cuts may not be completely clean. All things considered, this is an excellent bagel slicer that will make short work of anything you send its way. I think by now you should already have a good idea of the power of a Bagel Guillotine, and Bagel Biter’s version certainly meets that criteria as well. Its wide base provides good stability, and like all bagel guillotines, is very easy to use. 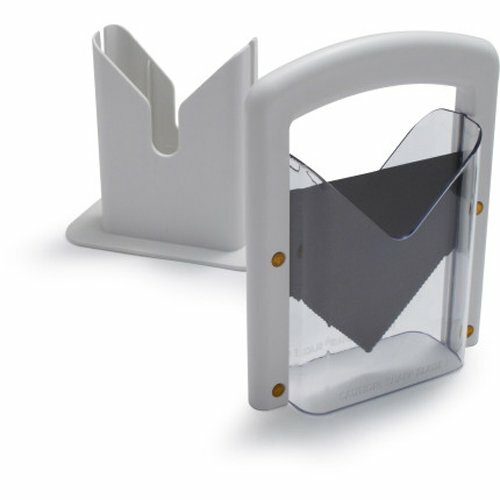 If you want an economical and effective slicer to handle your bagel slicing duties, you can rely on Bagel Biter’s Bagel Guillotine. Combining the look and feel of the old-fashioned cutting tools with modern day innovations, the Urban Trend Hometown Bagel Slicer is a sleek and effective tool that will make short work of a bagel. It not only boasts great utility, with how easy it is to wield and store, but has great safety features in the form of its plastic guard as well. You can be sure that your fingers are never in the way as a result, and you can even use this product for cutting muffins, baguettes, croissants, and more. The blade is also made from stainless steel and is very high quality for the smoothest cut. Seeing how it’s essentially just a knife with a plastic guard, you can be sure that cleaning it is about as easy as washing any other knife. The design of the Trudeau Adjustable Fruit and Bread Cutter is perhaps the most unique out of all the products covered in this review. It boasts a combination of stainless steel and plastic and is completely dishwasher safe. The main selling point of this product is that it is adjustable. You can set a custom height, meaning you can potentially make multiple slices on a large bagel. If you are looking for versatile kitchen gadgets, this fits the bill nicely. You can use it with other types of bread and even fruits. Another difference is that this product only slices horizontally, whereas most products cut vertically, so it is something to keep in mind if you have a certain preference for the axis of the cut. For consumers on an extremely tight budget, the Norpro Large Acrylic Bagel Slicer is the simplest and most straightforward product you can expect to see in any bagel slicer review. That’s because it isn’t even a slicer, but rather a bagel holder. It doesn’t come with a knife, so hopefully you have your own trusty knife for the task. Stylish and chic, this simple bagel slicing device doesn’t take up much countertop space but requires more manual work on your end. You can try this product out before committing to one of the more expensive bagel slicer models. Its minimalist design is non-adjustable but it gets the job done on a budget. An appropriate name for a product that looks like a guillotine… but for bagels. The bagel guillotine makes bagel slicing safe, easy, and morbidly fun. To use the tool, first secure the bagel in the plastic vice, and then push down on the guillotine. 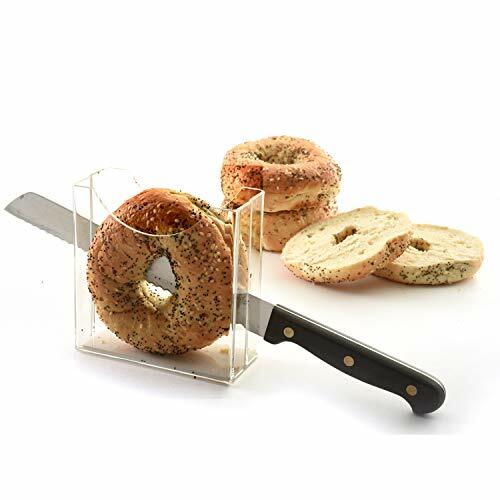 The wide base ensures it stays firmly in place as the large blade rushes toward the doomed bagel, and the acrylic guards will keep your hands and fingers safely away from danger. Bagel guillotines are probably the most popular type of bagel slicer on the market. It seems that its ease of use, appearance, safety features, and awesome name have made it a hit in many kitchens. And, let’s be honest, anyone who has messed up cutting a bagel must feel a sense of euphoria seeing a bagel cut cleanly in half by a guillotine. With that said, as awesome as bagel guillotines are they are not the only slicers on the market. At around $25 they provide great value, but there are other types of slicers that might give the bagel guillotine a run for the money. If you are on the hunt for a bagel slicer for use at a small company or if you just really like to eat bagels at home, then you are looking for more of the same type of products. 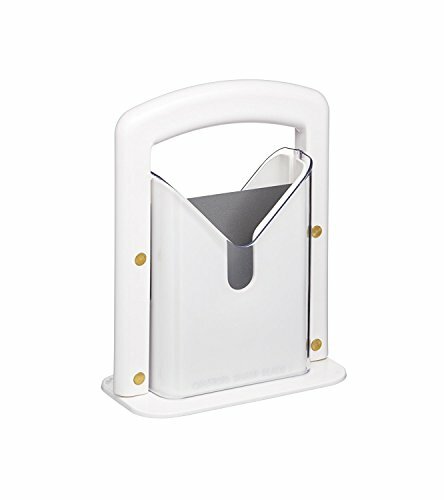 If you look at the Larien Bagel Biter, which it labels as a commercial bagel slicer, you can see it is essentially a bagel guillotine as well, just with some extra layers of plastic surrounding the base. Models like the Ironwood Gourmet Bagel Miter are a heavy duty take on traditional bagel slicer designs. However, electric bagel cutters may appeal to those who have to deal with a high volume of bagels everyday and don’t want to cut everything by hand. For instance, the Chef’s Choice 680 Bagel Pro electric bagel slicer can bisect bagels quickly with little effort on your part; just keep feeding it bagels and it will keep slicing them. The issue with nearly all electric bagel slicers is that they are very bulky and annoying to clean. Furthermore, electric products like these also tend to jam and are a nightmare to dismantle and clean the jammed up parts. Not to mention they command a higher price tag, at $45 and up they are approximately double the price of manual models. If you want a balance of safety, convenience, design, and an affordable price tag, we recommend you stick with the always reliable and cheaper manual bagel slicers. One downside to the Bagel Guillotine and its numerous copycat designs are that they occupy a large space on the countertop and even in storage. Perhaps a sleeker bagel cutter would be better suited to for your needs. Something like the Brooklyn Bagel Slicer may be what you are looking for. This product is essentially a serrated knife enclosed in a plastic cover. The cover makes it easier to wield the knife and cut a bagel in a natural motion and drastically reduces the chance of injury. Its blade is capable of cutting even the denser, bulkier bagels such as whole wheat bagels which health conscious individuals often eat. Furthermore, cleaning and storing it is straightforward, and its small footprint and low cost make it a fantastic bagel slicer for home use. If you are someone who is only interested in performance and can deal with a bulkier slicer that requires more maintenance, then there are some more products that may catch your eye. 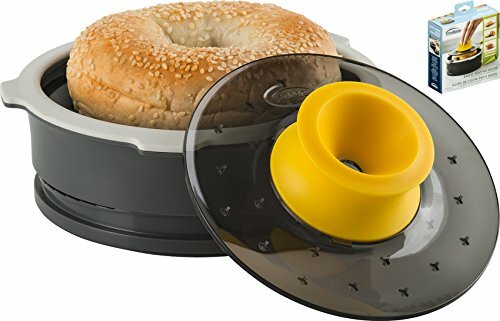 For instance, the Bagelpod is a fully covered bagel slicer that is not only safe and effective, but also a great conversation piece if you have guests over. For those of you who want to vary the size of your bagels, then you can check out vice-like bagel holders like those designed by Fox Run. Like the name suggests, they only hold the bagel in place, but you will have to use your own knife to make the cut, hence why it is so much cheaper. When selecting the best bagel slicer, one of the first considerations you make is whether you want an automated or manual slicer. Automated slicers are more expensive and are intended for cutting a high volume of bagels. You must determine how they are powered and if there will be any complications with cleaning. The benefit of an electric bagel slicer is that your hands will never come into contact with the blade whilst it is operating, so it is very safe. For the average person, a manual bagel slicer is probably the best for their needs and budget. Manual options are not exactly strenuous to use either; after all we are just talking about cutting bagels. Some manual products come with their own guided blades, and others are simply bagel holders and you have to cut the bagel with your own knife. Once you’ve decided on a manual or automated slicer, you have to consider the blade that you plan on using to cut the bagel. If you have already selected an option that comes with its own blade, consider if the blade is replaceable. Unless a blade is frequently sharpened, it will eventually dull and you may have to replace the entire product. Note that bagel guillotine blades are not likely to be replaceable. Some manual units are basically just guides and you have to use your own blade to cut. So if you already have a sharp knife that you take good care of, then you are already covered for this point. Otherwise, consider the cost of the product and the longevity of the blade and how long you can expect to use a bagel slicer before needing to buy a new one. So now you’ve cut the bagel and ate it, it is time to do some cleaning. No one likes this part of the process, so you’d better find a bagel slicer that is easy to clean. When looking for a bagel cutter, we recommend you look for one that is dishwasher safe. Of course this is not a requirement and should not be a deal breaker; after all, most manual products are quite simple in design and shouldn’t take too long to clean by hand. The same cannot be said for electric slicers, however. But having the luxury of putting it into the dishwasher would sweeten the deal and you will be more likely to use it more if you can just chuck it into the top rack. No one likes to spend too much time cleaning their kitchen products. They are supposed to simplify your life and save time, so what’s the point if it causes you to do extra work? Therefore, keep in mind how the clean-up process affects your buying choice. Nothing is created equal, and bagels are no exception. You will often be cutting bagels of differing shapes and thicknesses. With this fact in mind, it is a good idea to see if a bagel slicer lets you customize the cut. Maybe you want to cut a bagel into more than two pieces or maybe it sits a little off-centered and you want to adjust the position of the blade to account for this. So, if you want to slice your bagels perfectly every time or you just want to simplify your life when making breakfast or lunch, then a bagel slicer is a great addition to any well-equipped kitchen. If you have the countertop and storage space to spare, then it is hard to beat the ruthless efficiency that a guillotine slicer can provide. If your kitchen is already cluttered and you need all the space you can get, then a bagel knife or bagel holder are great alternatives. And if you need to cut dozens of bagels a day, then you are probably looking for an electric bagel slicer. All of them are capable of giving you a uniform cut and will protect your hand and fingers from injury. You may also be interested in reading about the best watermelon slicers.